In 2009, the York Family and the 49ers established the Edward J. DeBartolo, Sr. 49ers Hall of Fame, in honor of the beloved patriarch of the franchise. 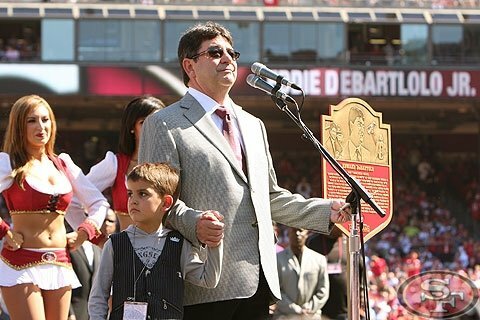 On Opening Day weekend, e2k and the 49ers, produced a series of events honoring the inaugural inductee, Edward J. DeBartolo, Jr. The festivities began with a star-studded banquet at the Palace Hotel, with appearances by Steve Young, Jerry Rice, Ronnie Lott, Mayor Willie Brown, Senator Diane Feinstein, MC Hammer, Paul Anka numerous 49ers alumni from the Super Bowl teams of the 80’s and 90’s. The next day, Candlestick Park came alive at halftime as Jerry Rice and 49ers President, Jed York, unveiled a commemorative plaque as Eddie stood surrounded by 60,000 fans, his family, and former players, including Joe Montana, Ronnie Lott. The weekend’s events were featured in two Comcast television specials. The Hall of Fame Ceremonies were produced by Lorie Murphy, direction, stage management and music production by Michael Olmstead, Tina Campos and Erin Olmstead. Tags: debartolo, eddie, Erin Olmstead, football, Lorie Murphy, Michael Olmstead.